Romeo, Pontiac, Lasalle, Clawson, Troy, Birmingham, Royal Oak, Ferndale, Windsor, Keego Harbor, Bloomfield Hills, West Bloomfield, Novi. 48311, 48312, 48310, 48313, 48314, 48093, 48092, 48088, 48397, 48090, 48317, 48026, 48015, 48083, 48038, 48085, 48071, 48089, 48091, 48315. We are located on 14 Mile Rd between John R Rd and I-75. Our dealership is located right across from Oakland Mall. Whether you have good credit, bad credit, or no credit, our team is ready to help you find a great used car that meets your budget. We sell all makes and models, with great late-model low-mileage selections from Ford, GM, Chrysler, Jeep and other brands. Whether you are looking for a used minivan, crossover, convertible, truck, suv or sedan, our team will help you find the perfect vehicle for your lifestyle. You can buy or lease your next car. We also have a great service department as well to help you with your next oil change, tire rotation and more. Visit me and our team at CARite of Madison Heights today and see why "Yes Means More" here! The manager of this store is John Tomasek. John has been with CARite since 2012 and is the proud store leader of the Madison Heights team. John has extensive experience in used car sales, financing and service management. John and his team are ready to help you finance your next car with a great car loan or used car lease. Read the location reviews or stop by to see for yourself why this location enjoys so much repeat business and a great local reputation. Through CARite stores, customers enjoy better cars, a better buying experience, and peace of mind with every purchase. In addition, our prices are highly competitive with a focus on providing you with true value. No traditional salespeople. Zero haggling. Great dealerships. Awesome products.We could go on... Bottom line: We're not here to sell you anything, we're just here to help you buy a Better Car! 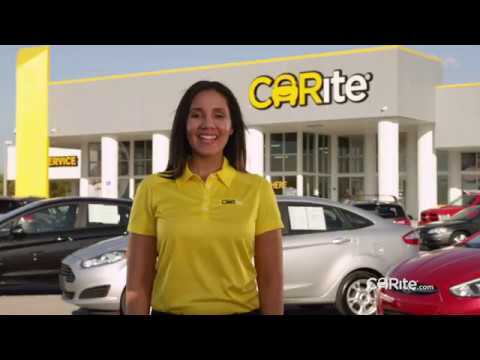 Visit your nearest CARite dealership to see for yourself. We've been impressing customers since 2011! Hasnat khan is a awesome salesman.. I have been to 3 dealerships. I had no credit score and I cannot believe how Roland was able to help me so quickly. Not only was he able to get me financed, he was able to finance my dream car! I recommend Roland and the Madison Heights Carite to anyone! I had a great experience working with Hasnat at Carite. He made the process simple, explained everything in detail, and answered any questions I had. Would definitely recommend to other buyers. Just a heads up, this experience was not just this location the reason I bring it up. Please have the salespeople stop driving the cars like personal vehicles. Customers don't want to test drive a dealership vehicle with a Craig's list feel. Cars should be detailed and come with an experienced walk through of the features. My 2014 escape transmission gave up on me on Jan. 12th and I had it towed to this location on Jan. 14th where I spoke to the service engineer Brad Johnson he continued to keep me up to date on my service as my transmission was getting fixed. Meanwhile the store manager John Tomasek helped me a ton for commute by allow me to use a car off there lot. Thanks!